Readers to Eaters, 9780983661566, 32pp. The search for good food led Alice Waters to France, and then back to Berkeley, California, where she started Chez Panisse restaurant and the Edible Schoolyard. For Alice, a delicious meal does not start in the kitchen, but in the fields with good soil and caring farmers. Jacqueline Briggs Martin, author of the Caldecott winner, Snowflake Bentley, teams up with Hayelin Choi, making her illustration debut, to show how one child's search for delicious led to a dream for all children to share the joy of tasty food--the same joy we get from a beautiful song, or a starry sky. 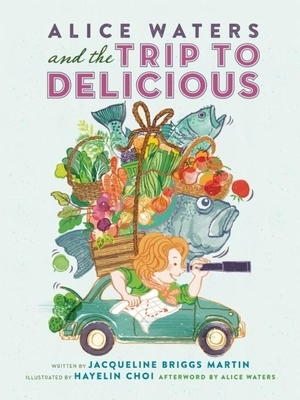 Alice Waters and the Trip to Delicious is the second of the author's Food Heroes series on people who changed what and how we eat, after the award-winning Farmer Will Allen and the Growing Table. Alice Waters founded Chez Panisse restaurant in 1971 and the Edible Schoolyard in 1995. She won the James Beard Award for Best Chef in 1992 and Chez Panisse was named the Best Restaurant in America by Gourmet in 2001. Time magazine named her among "100 Most Influential People in the World" in 2014. Jacqueline Briggs Martin is the author of Snowflake Bentley, winner of the 1999 Caldecott Medal. Her last book, Farmer Will Allen and the Growing Table, was named among the Best Nonfiction Books 2013 by School Library Journal and received a starred review from School Library Journal and Booklist. She has taught creative writing at Hamline College and University of Iowa Summer Writing Festival. She grew up on a farm in Maine and now lives in Mt. Vernon, IA. Learn more about Jacqueline at jacquelinebriggsmartin.com. Hayelin Choi Hayelin Choi is an illustrator and textile designer. This is her first picture book. She is a graduate of School of Visual Arts and lives in Queens, New York. Learn more about Hayelin at hayelinchoi.com. Alice Waters founded Chez Panisse restaurant in 1971 and the Edible Schoolyard in 1995. She won the James Beard Award for Best Chef in 1992 and Chez Panisse was named the Best Restaurant in America by Gourmet in 2001. Time magazine named her among "100 Most Influential People in the World" in 2014.